What Manners Can a Dog Have? How can we help your dog Fit into Your Lifestyle? Educated, Experienced, Working/High Drive dog specialists. Functional Obedience is the art of training ‘minds and manners’, and teaching a dog how to stay calm, and under control, in today’s urban environment. Our Functional Obedience programs are designed to help put you back in control, by teaching your dog to be ‘responsible for its own behavior’ whether you are close enough to correct – or not – regardless of dog’s excitement level, or distractions. Puppies are born with emotions, and temperaments. They are confident, fearful, curious, assertive, or exploratory. Working breed puppies are bold, forceful, and are constantly on the go. Every time you turn around they are causing problems. Nothing you try works. 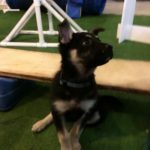 Toss out traditional puppy training and enroll your puppy in a program created to meet your puppy’s needs. Once you learn how to work with a high drive, energetic, and smart puppy then everything becomes easier. We help solve your problems. We work hard to keep up to date in the latest behavior therapy and techniques. We do not engage in a ‘quick fix’, bandage approach. Our programs are based on approaches with decades of successful case studies. Winter Weather: We will post closures and cancelations on our facebook page.